Sherry Craven is a writer, educator, and editor. Recently retired from university teaching (creative writing and literature), she now gives much energy to writing poetry and nonfiction. She has published poetry in both English and Spanish. 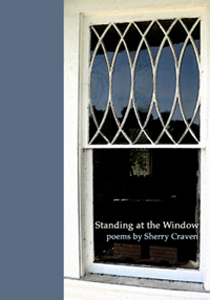 Her collection, Standing at the Window, is available from VAC Poetry. In 2009 one of her poems was nominated for a Silver Spur Poetry Award. Her poetry has appeared in Amarillo Bay, Muse2, New Texas, The Witness, Windhover, descant, Maverick Press, Texas Review, Concho River Review, Two Southwests, and she is included in the anthology Quotable Texas Women. Her poetry appears in the 2002 anthology, Texas in Poetry 2 and her nonfiction in Writing on the Wind, a collection of essays by West Texas women writing about sense of place. She won the Conference of College Teachers of English 2005 poetry award.